Sothys: Free Hydradvance Cream with Hydradvance serum, & a complaint against Sothys Facebook customer service. Free Hydradvance Cream worth RM242 + elegant Bottega inspired dinner clutch with every purchase of SOTHYS Award Winning Hydradvance serum! 10th June 2013: - When I went to visit the Sothys Flagship 128 Faubourg salon in Empire Gallery, apparently this product is now retailing for Rm480! I thought it was just going to be Rm414... sheesh.. they just increased the price by Rm66! Think I will just have to let go of this promotion. I was initially thinking of getting this, but I already have heaps of hydrating serum at home, not to mention a korean hydrating gel I bought recently. Recently I have a chip to pick against the Sothys, because the people managing their Facebook account were really incompetent and rude to me. They have yet to apologize to me when I mentioned why they had to keep their bloggers meet so secret. As a both a blogger and Sothys customer, I feel it is necessary to let people know when companies do not treat customers with the respect they are accorded. I am not really happy being a long time customer of Sothys since 2008, and having paid thousands of ringgit for my beauty treatments and products from 128 Faubourg. 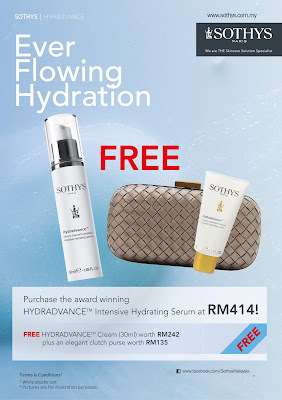 As such, I dont think I should part my money to buy their products, with Sothys having such bad customer service, and also since I have yet to finish my current, eventhough this current promotion seems to be good.